Version 4003 works very fast. Guild Wars is an episodic series of massively multiplayer online role-playing games developed by ArenaNet and published by NCsoft. 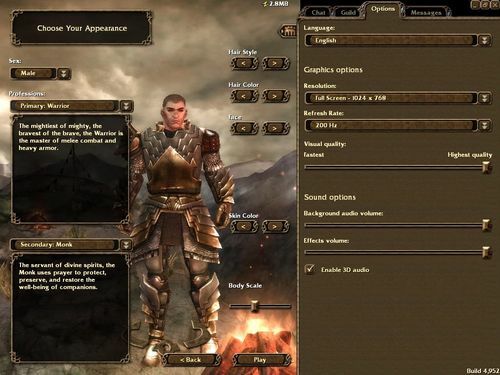 Although often defined as an MMORPG, the developers define it as a CORPG due to notable differences from the MMORPG genre. 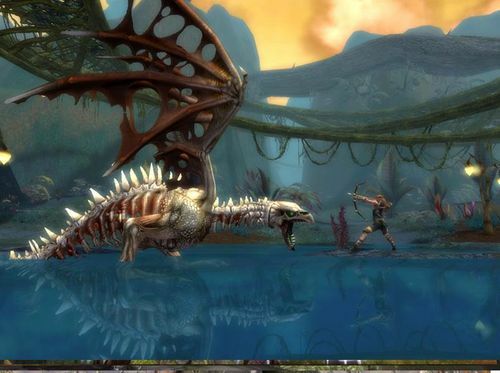 It provides two main modes of gameplayÃƒÂ¢Ã¢â€šÂ¬Ã¢â‚¬Âa cooperative role-playing component and a competitive player vs. player (PvP) componentÃƒÂ¢Ã¢â€šÂ¬Ã¢â‚¬Âboth of which are hosted on ArenaNet's servers. Three stand-alone episodes and one expansion pack were released in the series from April 2005 to August 2007. 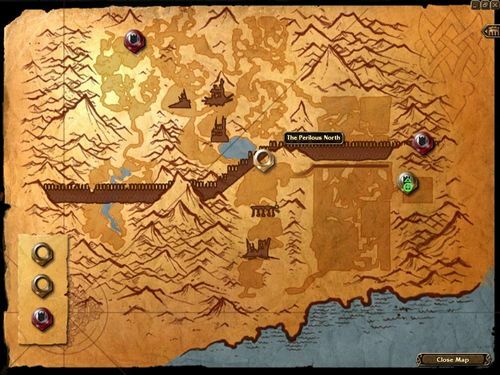 The games depict the history of the fictional fantasy world of Tyria; each campaign focuses on events in disjoint sections of the world at roughly the same time. 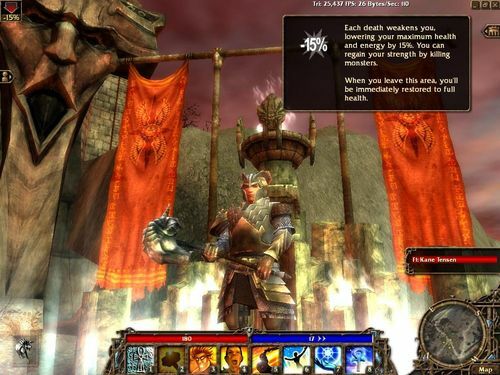 A player creates an avatar to play through the cooperative storyline of a campaign, taking on the role of a hero who must save Tyria from episode-specific antagonists. 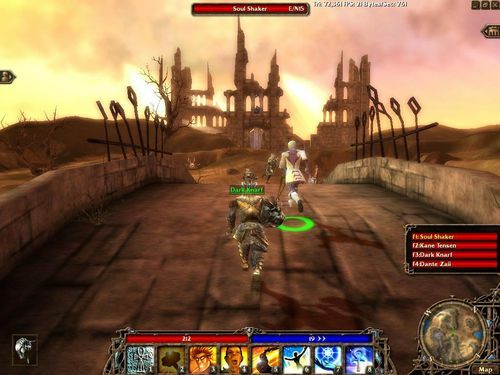 Players can group with other players and non-player characters, known as henchmen and heroes, to perform missions and quests found throughout the game-world. PvP combat is consensual, team based, and limited to areas designed for such combat. Players are allowed to create characters at maximum level and the best equipment specifically for PvP play, which is unusual for MMORPGs. ArenaNet hosts official Guild Wars tournaments where the most successful players and guilds may compete for the chance to play live at gaming conventions and win prizes up to US$100,000. - The Downloader is not shown. Instead you will see a splash screen. At the first launch time this download can take a huge time, so please wait a while. - Starting the game in window mode crashes. Use Command + Enter instead. - The @ Symbol is very difficult to type in on many keyboard layouts. You could try to use copy&paste or to use a onscreen-keyboard. Just start the game, after installing it with the package. The basic client from the official guild wars homepage is included. This is just perfect, thank you very much! Is there any way to make it work on tiger? Yeah I could use an older Cider Wrapper. But the Cider Wrapper 4003 is running very good. Older Ciders Wrappers are having mouse and keyboard lags. Maybe it would be easier to make a CXZ Wrapper for Tiger users. But it would be not as fast. The easiest solution for you would be to buy SL. 29$ is not that much. But if you want, I can build the CXZ Wrapper. Thanks a lot for this port! However, the graphics in your screenshots looks nice! Any way of making Guild Wars look like that? Put everything on highest details and full resolution and play the whole game. Then you will see this graphics or buy a new mac, if your mac cannot run it at highest detail. is there a way to use this port with ATI X1600? Hmm, I have some ideas, but I need my new macbook to do this. I will send you a test version of the wrapper, when i did it. i cannot get mine to download guild wars. i let it download overnight for 14 hours and nothing happened, and little snitch didnt show any network activity coming from it either. any ideas? I do not know why, i already got a pm about a similar problem. Maybe arena.net put an update to the download that does not work correctly with my port. I cannot test this, because my new macbook did not arrived till now. The only thing you can try is putting your windows files into the wrapper. Right-click on the wrapper. Navigate to Contents - Resources - transgaming - c_drive - Program Files - Guild Wars. There put your fw files from windows. Please feedback on this error, I will start working on it when my macbook arrives. Try to use command + enter for windowed mode, and select a lower resolution, then you have a type of windowed-fullscreen mode.